Besant Memorial Animal Dispensary is an animal shelter with a veterinary clinic setup to rehabilitate injured and ill animals. If you love animals and want to help, drop by! Nicknamed BMAD, the Besant Memorial Animal Dispensary is an NGO that was once run by the Blue Cross. Poor maintenance and inadequate care made it unsuitable for them to function effectively. Enter Shravan Krishnan, popular animal rights activist and founder of Hotel For Dogs, Shravan was offered the job to make the shelter work again. So he set off on his journey to do so eight months ago. Since then they’ve rebranded to BMAD, increased the size of the shelter to house more dogs, cats, pigs, kites and other animals, signed on six full-time caretakers, hired two full-time vets and acquired an ambulance for emergencies. The idea behind BMAD is to rehabilitate and find homes for ill stray animals and to raise the money to achieve that they function as a veterinary clinic. They have the resources and staff to perform most surgical procedures and the income from their veterinary work is used to run the facility. BMAD also pays special attention to Animal Birth Control for strays with their ABC surgery programme where they neuter strays at their facility out of their own pocket. 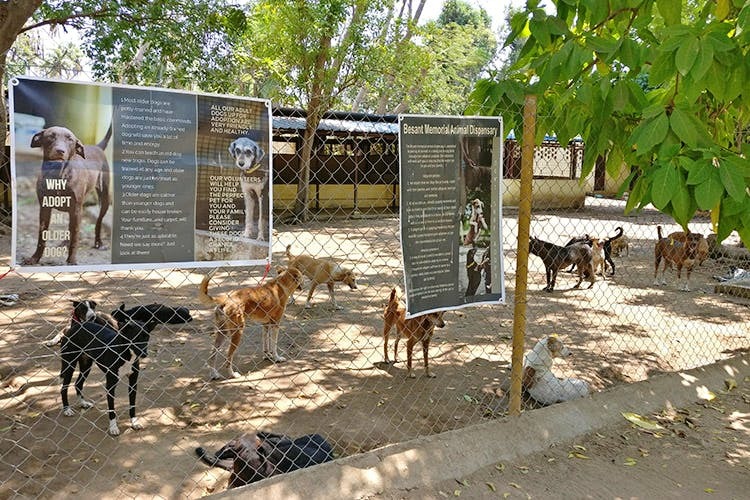 What was once a rundown facility that couldn’t care for its furry residents has now turned into a busy shelter that’s providing love and support to a huge number of animals and we absolutely love them for that. We recommend checking out BMAD if you’re an animal lover, there’s enough cuteness there to make you not want to leave. Speaking of not wanting to leave, if you’re interested they have a volunteer network where you can contribute in any way possible. That could mean finding people willing to adopt, helping with upkeep by cleaning enclosures and animals or even just assisting in other day-to-day matters. For those of you interested in adopting there are plenty of dogs and cats at the shelter that needs homes and they are are all in good health. We especially like the effort they go into assessing future pet owners, with as much as home visits to ensure proper living conditions. It’s things like that that make a world of a difference to the animals and we’re happy to see these guys do it. Shravan himself is an experienced animal rescuer who works in tandem with the Forest Department to rescue wildlife in and around the city, so if you do happen to encounter such an emergency you can reach them on the number below.